Transport Scotland has presented its refined design for the planned dual carriageway over the battlefield at Killiecrankie together with the results of this summer’s archaeological investigations. The aim of the changes is to reduce the huge imprint that the original design was going to create. To achieve this Transport Scotland and Jacobs, the design consultants, have produced a plan that not only inflicts worse damage on several aspects of the historic environment but also causes an unexpected adverse impact on the landscape. The refined design has been made in response to one of the many criticisms that Historic Environment Scotland (HES) stated in its objection to the plan. The original design was first made public in March 2016. It is based on importing tons of earthworks to build up the new road infrastructure on the northbound side of the existing road. 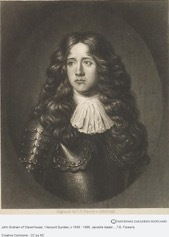 HES advised Transport Scotland and Jacobs before the design was chosen that significant earthworks were not compatible with the protection and enhancement of the Killiecrankie battlefield. Nevertheless the design went ahead with extra earthworks incorporated for aesthetic purposes. The idea was to soften the impact on the landscape by integrating the new infrastructure into the landform by using gently sloping embankments. It is important to note that the earthworks mitigation measures (i.e. wide embankments with shallow gradients) were embedded within the design and taken into account when making impact assessments at an early stage of the planning process. That landscape mitigation is now being jettisoned. The original design was going to use 150,000m3 of infill on the most sensitive part of the battlefield. By replacing the wide, gentle embankments with dramatically steep slopes and by replacing an acoustic bund (an earth hill) that would have absorbed noise with 2 walls that will reflect noise, Transport Scotland will reduce the required earthworks by 50,000m3. Jacobs claim that the impact on landscape and noise will remain as predicted in the Environmental Statement (ES) that accompanies its final plan in November 2017. This raises many questions. How can the impact on landscape and noise be unchanged when embedded mitigation has been removed? 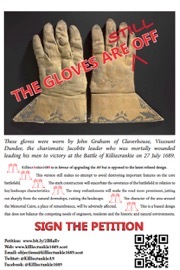 Are the impact assessments fair representations of the situation in Killiecrankie? Does Cairngorms National Park Authority have to review the Killiecrankie area now that the road will visually assault the landscape? The cost benefit for choosing to widen on the northbound carriageway compared with widening on the southbound was £30m, because of the balance of earthworks. By how much does the cost benefit shrink when the balance of earthworks is less favourable? How can Transport Scotland defend a change that causes more damage to the historic environment? The refined plan needs 100,000m3 of infill to create the new infrastructure over what is still considered to be the most sensitive part of the battlefield. It will degrade the site to an unnecessary extent and damage every historic feature that is listed in our objection. Most crucially, the prominent new design will intensify the sense of severance (division) of the battlefield in relation to key landscape characteristics. The road designers were aware that the original plan was going to make the A9 a more prominent feature on the battlefield and that the severance that it already causes would be reinforced. The refined design makes no apology for the road. It will become the most prominent feature of the landscape, jutting out from the downslope and all but completing the severance. Transport Scotland had tried to suggest that further archaeological surveys would vindicate its choice of alignment and design. That has not worked either. There is nothing in the latest archaeological surveys to alter the interpretation of the battle as described in the Inventory of Historic Battlefields. Indeed, it strengthens the Inventory narrative. While none of the mystery pits has turned out to be a burial pit, another large pit-like anomaly has been discovered but not evaluated in the area around Urrard House, identified as the core fighting area in the Inventory. The story of the A9 across Killiecrankie is long and complicated. The original design attracted 183 objections, including one apiece from HES, Perth and Kinross Heritage Trust (PKHT), Perth and Kinross Council (PKC), Cairngorms National Park Authority (CNPA), Scottish Environment Protection Agency (SEPA), heritage and archaeology groups, historians and local residents. KilliecrAnkie1689 is in favour of upgrading the A9 but opposes this refined plan that has brought all the shortcomings of process, methodology and design into sharp focus. Transport Scotland has only ever paid lip service to the protection of the historical environment and never considered its enhancement. In a last minute effort to address one part of HES’s objection, Jacobs has narrowed the imprint of the construction. But the refined design fails abjectly to address the fundamental issues and has triggered a host of new problems. Navigate the refined design by following the menu bar along the top. On the column on the right, under the ARCHIVE label, are all the website pages. Maps, objections, the proposed route, the process, the history of the battle and our campaign are there.